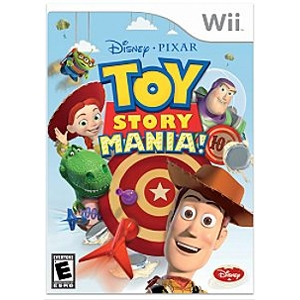 ValleySeek.com: Disney Interactive 10160200 Disney Interactive Toy Story Mania! Disney Interactive Toy Story Mania! Toy Story Mania! allows players to participate in familiar and all-new carnival-inspired shooting galleries and win top prizes in mini-games. The game features multi-player competitive and cooperative modes supporting up to two players, providing hours of fun. Bonus unlockables let players experience parts of the game in eye-popping 3-D. Includes 2 pairs of 3-D glasses. Software Name: Toy Story Mania!